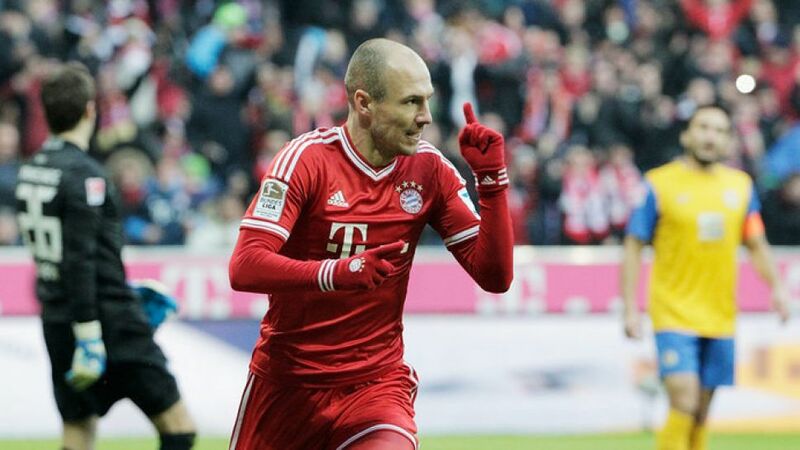 Munich - Arjen Robben was the star of the show as FC Bayern München eased to their eighth home victory in as many games with a 2-0 triumph over lowly Eintracht Braunschweig. The winger broke the visitors' resistance as early as the second minute and doubled his tally with a well-taken finish in a one-sided match Pep Guardiola's charges dominated from start to finish. The match had been billed as a mission impossible for Eintracht Braunschweig and they got off to the worst possible start. The guests pulled everyone back behind the ball from the off, allowing Bayern time and space to spray passes around unchallenged. Barely a minute had passed when Mario Götze dinked a ball over the top of a crowded defence for Robben, whose initial effort came back off the post. However, the Dutchman reacted first to head the rebound into the empty net. The match continued unabated in the same vein, with the deep-lying visitors barely touching the ball as Bayern enjoyed well over 80 per cent of possession throughout the first period. Braunschweig did not appear to mind, seemingly content to keep the scoreline looking respectable. On the rare occasions the Lions did win the ball back, their efforts going forward were tame and were swiftly snuffed out. Bayern patiently continued to probe and were rewarded with a second goal on the half hour mark. Toni Kroos fizzed a cross-field pass to Robben on the right-hand edge of the Braunschweig box and the 29-year-old brought it down on his chest, cut inside onto his left foot and curled a shot into the top corner. It was the least the hosts deserved for a first-half display in which they were utterly dominant. That soon changed in the second half, however, as Braunschweig re-appeared with a greater sense of courage after the interval. Manuel Neuer had to scramble to his left to keep out a deflected shot that was on its way in, before the No1 breathed a sigh of relief when Ermin Bicakcic failed to connect with Kevin Kratz's corner following a defensive mix-up. Despite withering looks from Guardiola on the sidelines, Bayern continued to play with the handbrake firmly on, a fact that encouraged the visitors to come out of their shell. After Robben brushed the crossbar with a free-kick, Braunschweig could have pulled a goal back but for the heroics of Neuer and David Alaba. The custodian rushed out of his box to deny Domi Kumbela and Kratz's 20-yard first-time effort from the rebound was hooked over by the young left-back. Bayern's uncharacteristic sloppiness almost allowed Braunschweig a souvenir goal, as a poor tackle from Daniel van Buyten gave the Lions a free-kick on the edge of the box, from which Kratz struck the crossbar via a deflection. The hosts gave the impression they could have scored more if they needed to, but settled instead for a 2-0 win - their sixth consecutive victory in the league.